At the Real Estate Studio, we count ourselves fortunate to experience so many wonderful homes in the Charleston area. This time of year, there are certain elements in homes that often enjoy more attention from prospective buyers: the outdoors. The South Carolina Lowcountry is a summer dream, often enhanced with screened porches, shade trees, rooftop decks, and oh yes, the swimming pools. Many historic homes on the Charleston peninsula have incorporated beautiful swimming pools into their courtyards to provide a welcome reprieve to the summer heat, and as you can see here, the eye for exquisite, luxurious detail does not end with the interior finishes of these grand homes. Grab your sunscreen and margaritas. The garden party begins promptly at noon. This swanky antebellum home orients around its formal walled garden designed by Sheila Wertimer, with each of the downstairs formal rooms opening to the courtyard. In a flaunting symphony of geometry, the dipping pool completes a stunning visual, which is on full display from the overlooking balconies of the master bedroom! Click HERE to view all the details and photos! Situated just south of Charleston’s French Quarter, the views of the Holy City skyline from the courtyard of this restored 1910 home are stunning! A crystal clear lap pool accentuates the far end of the historic space laden with stone and bordered by an antique brick wall exuding Charleston Charm. The walled garden of this 1920s brick home boasts a unique raised pool design that complements the private courtyard, which flows naturally from the home’s kitchen and deck. In addition to providing the perfect entertaining spot, a short walk from the gate leads you to the iconic sunset views on Charleston’s Battery. Originally built around 1754 on a serene block of Church Street, this exquisite South of Broad home has enjoyed a masterful restoration inside and out. The beautiful garden features a series of outdoor rooms, with areas for seating, dining, and lounging around the large blue-stone flanked pool. The home’s interior and garden flow seamlessly together, perfect for entertaining. The separate pool/guest house has French doors that open right onto the pool, and has a lovely living area of its own. Just around the corner from White Point Gardens on Charleston’s Battery, this 1887 Charleston Single House embraces its courtyard with efficient use of space. A saltwater lap pool anchors the delightful landscaping designed by renowned landscape architect Shelia Wetimer. As a bonus, the lower piazza features an outdoor built-in grill! From the back porch of this 1930s Colonial home, you’ll find a relaxing retreat accented under the shade of a pergola. The neatly outfitted pool surrounded by gardens includes a separate pool house that can also serve as a guest residence or work studio! The outdoor space of this classic 1850 Charleston Single House boasts an exquisite gem: a shaded saltwater pool with gentle waterfalls, all surrounded by beautiful IPE decking. Added bonus: a dedicated pool house that can be employed as a studio office. 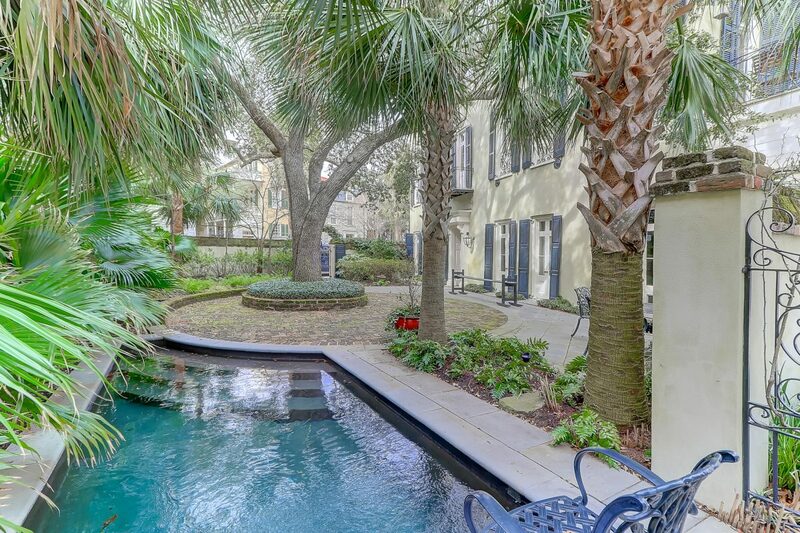 Just steps away from Charleston’s East Battery, this classic Charleston Single House offers a stunning private oasis. The pool connects seamlessly to the window-laden sitting room in the home, and is accented by an adorable cabana, complete with its own kitchen!